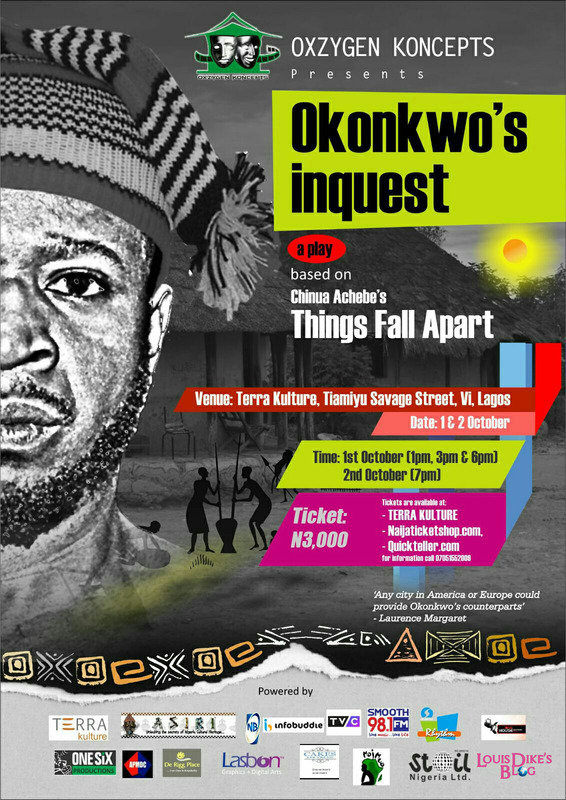 Home > Chinua Achebe > Events > October 1st > Okonkwo's Inquest > Stage Play > Terrakulture > Things Fall Apart > #StagePlay: @OxzygenKoncepts presents "Okonkwo's Inquest" inspired by "Things Fall Apart"
#StagePlay: @OxzygenKoncepts presents "Okonkwo's Inquest" inspired by "Things Fall Apart"
Set in a land, not too far away from you. There lived a hardworking man, named Okonkwo, who never really had things easy in his early life, but worked his way to recognition. Showing at Terrakulture on October 1st and 2nd. Ticket: N3000. With hard work and perseverance, Okonkwo became a respected person among his people. However, things took an unfortunate turn for Okonkwo; from a hero, he became the spite of Umuofia and was buried like a dog. What could have led to this turn of fate? 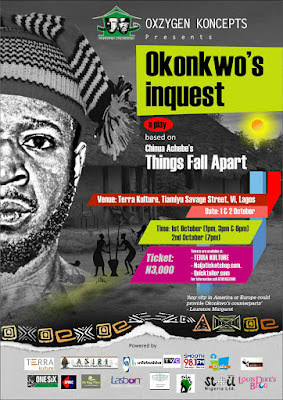 OKONKWO’S INQUEST is a stage play inspired by Chinua Achebe’s classic novel “THINGS FALL APART”. The play intends to rationalize human reactions to strange cultures and dogmas through a post mortem on the fatal consequences of colonial assumptions of the African traditional structure. Okonkwo’s Inquest is a devised Theatre workshop play directed by multiple award winning Theatre veteran Toyin Oshinaike and is proudly produced by Oxzygen Koncepts. Oxzygen Koncepts is a Theatre production company with an artistic difference led by Zara Udofia Ejoh & Toritseju Ejoh. The company seeks to entertain and educate audiences, using Theatre as the primary medium of communication. At Oxzygen Koncepts, our mission is to create new exciting pieces and recreate traditional classic pieces that fit the fast paced times of the 21st century. Our performances are always a new experience for our audience even if it is a performance in our repertoire. The play will premiere at Terra Kulture, Lagos. This event is supported by;Terra Kulture, De Rigg Hotels, Surview Marine, Nigeria Associated Port & Marine Development Company, The Anirejuoritse Global Nigeria Ltd, Stoil Nigeria Ltd, Lasbon graphics + Digital Arts, Infobuddie, Asiri Magazine, Louis Dike Blog, Silverbird Rhythm 93.7fm, Onesix Productions, Majmua Theatre, Onehouse Lighting Crew and Thespian Muse.